Jamawar is the most exquisite product.It is among the most refined artistry of Kashmirs designs and is the mark of royalty and nobility. 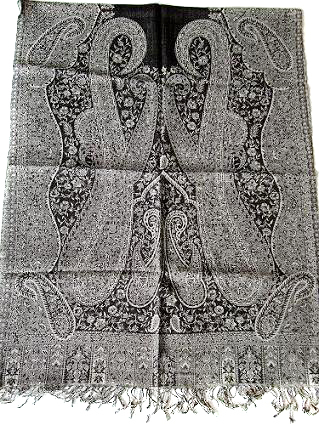 The jamavar wool shawl uses different kashmiri artistic designs to enhance its look. Wool jamawar shawls are Lightweight and made from 100% wool. This entry was posted in Wool Shawls and tagged ArI Embroidery Wool Shawls, Boiled Wool Embroidery Shawls, Boiled Wool Jamawar Shawls, Fine Wool Shawls, Indian Wool Shawls, Jamawar Shawls, Jamawar Wool Shawls, Kalamkari Wool Shawls, kani wool shawls, Kashmiri Jamawar Shawls, pashmina-wool shawls, Reversible Wool Shawls, Shawls, Silk Wool shawls, viscose-wool shawls, Wool, Wool Blended Shawls.